As many people have mentioned over the last couple of weeks, it is 25 years since the start of the last great Miners Strike in Britain. On 5 March 1984, mineworkers at Cortonwood colliery in South Yorkshire walked out and the strike soon spread to other parts of the country. The focus of the strike was the threat of pit closures, but everybody involved knew that there was much more at stake than simply jobs in the mining industry (important as that was). Margaret Thatcher's Conservative government was clearly determined not just to win the strike but to decisively break the most powerful section of the working class. Ten years before (in 1974) the previous Tory government had after all been forced to resign after a miners strike, and another strike in 1972 had led to power cuts. This time round the state had made elaborate preparations, stockpiling coal and putting in place a massive police operation. As a result, the direct economic impact of the strike was minimised - power stations and other industries were not closed down, a major factor in the strike's eventual defeat a year later. The strike did though have a huge impact across society, and it has now assumed a kind of depoliticized iconic status. Witness the ongoing success of the film/musical Billy Elliot, the story of a young boy learning to dance against the backdrop of the strike. Witness too a recent advert for Hovis bread in which images of the strike feature in a parade of images of Northern authenticity that the little brown loaf has borne witness too! I am not even going to attempt an overall analysis of a year of hope, violence, solidarity, betrayal and ultimately defeat. But I am planning a series of posts setting down some of my memories and reflections, including some of the musical aspects of the strike. Several songs were written about the Miners Strike, and many more performed at the countless benefit gigs up and down the country. But if there's one piece of singing that reminds more than any other of the strike it's the chant 'Here We Go', heard on demonstrations and picket lines, and sungalong to in bars and parties. For instance, Bob Hume recalls that at Hatfield Main Miners Welfare club in Yorkshire 'We brought the New Year in  with a disco/buffet... knees up, for all our kitchen staff, pickets and visiting friends, the night and early morning came with rousing 'Here We Goes', the Red Flag and Never Walk Alone'. Here We Go is a football chant (in the US as well as UK) sung to the tune of Sousa's Stars and Stripes Forever. Banner Theatre recorded a cassette based on the strike called "Here We Go" in 1985. 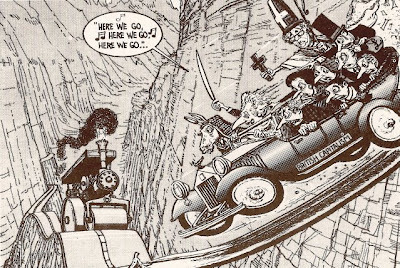 The cartoon below from the time of the strike shows Thatcher & Co. singing the song as the car of 'British Capitalism' heads towards a crash.